This compact access point ensures the most cost-effective Wi-Fi connectivity for indoor premises including hotel rooms, dormitories, small offices and remote workstations. It’s software configurable to operate in either 1x1 dual radio mode, or 2x2 single radio mode. Powered by PoE, it minimizes power consumption with rich features that further facilitates a highly efficient and reliable wireless network, and combines wireless and wired access in a single compact device. This AP can be easily mounted to a standard data wall-box using the existing structured cabling system or converted to a desk mounted AP using an optional mounting kit. Patented ClientMatch™ technology improves performance and eliminates sticky client behavior while roaming. AppRF technology enables prioritization and policy enforcement for business-critical enterprise apps like Microsoft Lync. The AP-203H can be deployed as a wall-mounted hospitality AP or converted to a desk mounted remote AP. 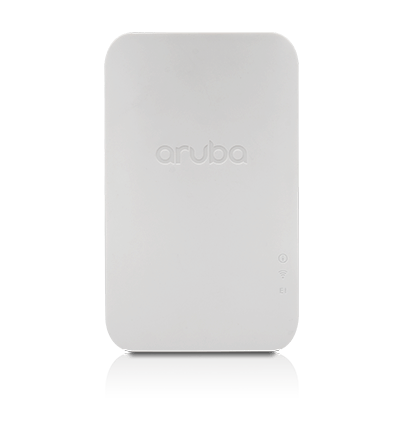 These blazing fast 802.11ac APs offer flexible deployment options at a great cost. Two integrated dual-band moderately directional antennas for 2x2 MIMO with maximum individual antenna gain of 4.9dBi in 2.4GHz and 6.0dBi in 5GHz. Built-in antennas are optimized for vertical orientation of the AP. The horizontal beamwidth is roughly 120 degrees. Combining the patterns of each of the antennas of the MIMO radios (in 2x2 mode), the peak gain of the effective per-antenna pattern is 2.3dBi in 2.4GHz and 3.4dBi in 5GHz. 1 256-QAM modulation (802.11ac) supported by the 2.4GHz radio as well. Maximum (worst-case) power consumption: 7.4W. Maximum (worst-case) power consumption in idle mode: 3.9W. The AP ships with a mounting plate to attach the AP to a single-gang wall-box (most international variations covered). The AP securely attaches to the plate; a custom security tool to remove the AP from the plate ships with the product. Several optional mount kits are available to attach the AP to a dual-gang wall-box, directly to the wall, or to support desk mounting.